Giada’s Red Wine Risotto | Mmm, Tasty! Just before Christmas, I got an email from the community manager at Foodtv.ca, asking for my phone number, as they wanted to send me something by courier. I was curious as to what they might be sending, but decided to just wait and let it be a surprise instead of asking outright. 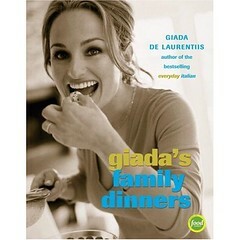 A few days later, a copy of Giada De Laurentiis’ Family Dinners showed up at my door, presumably as a gift for doing guest blogging for Foodtv.ca this past year. Anyone who knows me knows I love cookbooks, so this was a wonderful surprise. Thanks Foodtv.ca! I decided the first recipe I’d try would be the Red Wine Risotto. 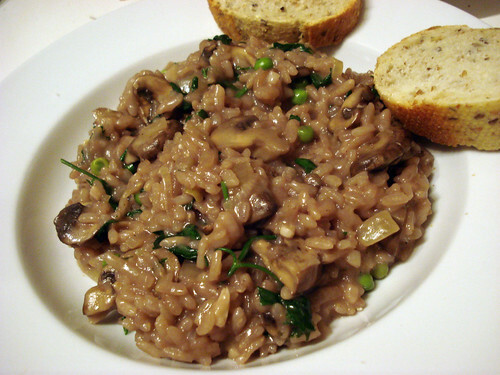 I love risotto in the winter; it’s such a comfort food, and this particular recipe is vegetarian-friendly with only a small modification. I decided to add some cremini mushrooms to mine to make it more of a meal. Verdict? Really tasty. Rich loved it so much that he wanted to take the leftovers for work the next day. I also wanted the leftovers for work. Next time I think I’ll make a double batch. Melt the butter in a heavy large saucepan over medium heat. Add the onion and saute until translucent, about 8 minutes. Stir in the garlic and saute for 30 seconds. Stir in the rice and cook for about 2 minutes until the rice is toasted. Add the wine and stir until it is absorbed, about 1 minute. Add 3/4 cup of hot broth; simmer over medium-low heat until the liquid is absorbed, stirring often, about 6 minutes. At this point, add in your mushrooms. Continue adding 3/4 cup of hot broth 3 more times, stirring often, about 15 minutes. Add the remaining broth and simmer until the rice is just tender and the mixture is creamy, about 5 minutes longer. Stir in the peas and parsley. Add the 1/2 cup of Parmesan. Season, to taste, with salt and pepper. Spoon the risotto into bowls. Sprinkle additional cheese over and serve. The Daring Bakers do… Lasagne?